To continue in our mission to further serve our clients, we joined forces with Alliance Wealth Management Group to integrate additional key services that are essential to your financial success - investment management and financial planning along with our existing tax & accounting services. 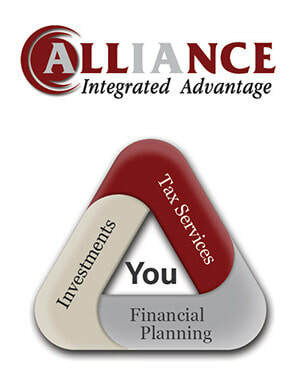 The Alliance Integrated Advantage - One cohesive experience that provides investment, tax, and financial planning services to help you with all of your financial needs and goals. Through the Alliance Integrated Advantage, we enable a caring and competent delivery of life solutions providing more ease and less stress to your life, while providing a team of experts that work together for your success. ​​Whether you are building your wealth, looking to transition to retirement, or even considering a second career, the Alliance Integrated Advantage provides a complete financial solution for your ultimate success.